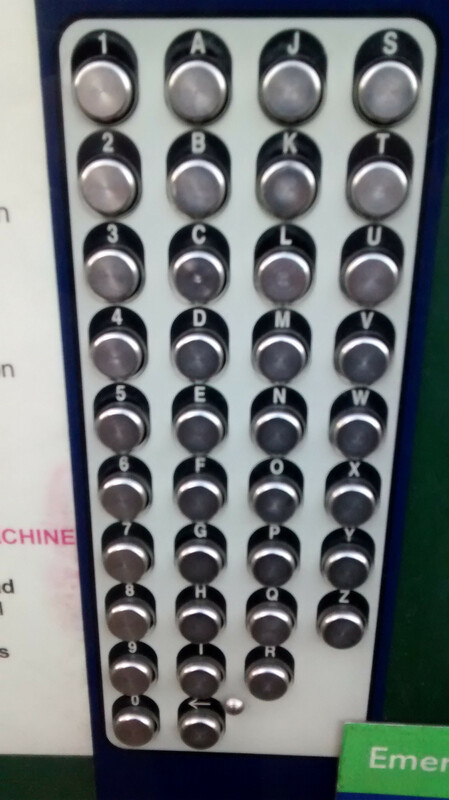 This is the letter and number interface on the machine. It has to be tall and narrow as the ticket machine is tall and narrow. I (and clearly the people who I had to wait behind) had trouble quickly picking the letters and numbers from the keypad. Creating groups: for example one for the numbers other for the letters; maybe also for the first half of the alphabet and for the second half. Using a different color for numbers and letters. Displaying the letters and numbers horizontally rather than vertically. I think it is easier to scan the content the way we read (left to right and from a to z). Also the first letter of each line helps to find the row/column we are looking for. As the interface is much taller than wide it's easier to do so horizontally with 8, for example, (horizontal) lines rather than 3 (vertical) ones.